Wall Street didn't flinch at the sudden exits of White House officials like Steve Bannon, Reince Priebus and Sean Spicer. Things may not stay as calm if Gary Cohn follows them out the door. Cohn is President Trump's top economic adviser, and considered to be one of the most important remaining players in the administration. Cohn has acted as a moderating force on Trump's populist instincts on delicate issues like trade. Cohn is also quarterbacking the push to cut taxes along with Treasury Secretary Steve Mnuchin. Cohn is such a vital member of Team Trump that rumors over his resignation due to the president's handling of the violence in Charlottesville spooked the market last week, briefly causing stocks to drop on Thursday morning. A White House official sought to reassure Wall Street, telling reporters that "nothing has changed," and that reports of Cohn's stepping down as director of the National Economic Council are "100% false." Investors are hoping that the former Goldman Sachs (GS) president will remain a source of stability and reason in the often-chaotic White House. 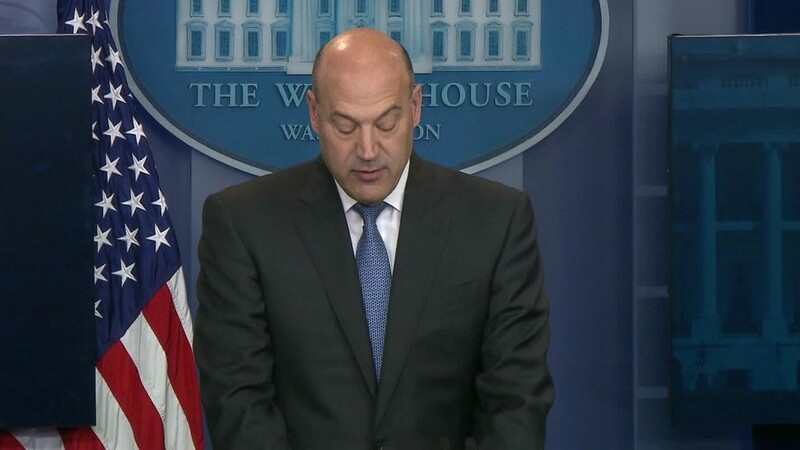 "The loss of Cohn would be another point of destabilization on tax reform, which is what the market wants desperately," said Mark Luschini, chief strategist at Janney Capital, which manage more than $50 billion in assets. "Cohn is viewed as a pretty steady, level-headed guy," he said. Normally, Wall Street might not care about the day-to-day personnel moves inside the White House. But Cohn's pro-business views have comforted investors unsettled by Trump's populist campaign platform, especially his promises to rip up NAFTA and label China a currency manipulator. "If Cohn were to leave, Trump's economic policies could take a turn to the more populist side, a turn that markets would not appreciate," Nomura chief U.S. economist Lewis Alexander warned in a report on Monday. Such a shift could alarm Wall Street as the White House gears up for key battles in September over the budget, tax reform and renegotiating NAFTA. Investors are also on guard for a potential government shutdown or a stand-off over the debt ceiling, which needs to be raised to avoid a disastrous default. "Gary Cohn is very establishment. He's basically Mr. Goldman Sachs. He's not fringe," said Ed Yardeni, president of investment advisory Yardeni Research. Of course, Cohn's career moves aren't the only thing the market cares about. Ultimately, the direction of the U.S. economy and corporate profits are what will influence stock prices in the long run. It's also worth noting that Cohn may leave the White House soon to take an even more important job. Trump told The Wall Street Journal last month that he's considering Cohn to replace Federal Reserve chair Janet Yellen when her term expires in February. In some ways, Cohn's standing in the White House seems to have been bolstered by the firing of Bannon, Trump's chief strategist. The two officials frequently butted heads, with Bannon representing the populist or nationalist views that make markets nervous. "Steve Bannon's departure is undoubtedly a noteworthy victory for the globalists inside the administration" like Cohn, Isaac Boltansky, director of policy research at Compass Point Research & Trading, wrote in a report on Monday. But Boltansky urged investors not to celebrate yet. He pointed out the tumultuous nature of the White House and warned that Bannon's return to Breitbart gives him a powerful platform to influence future policy debates. "The reality TV nature of the West Wing wars suggest that there could be a reversal of fortunes on the other side of the commercial break," Boltansky wrote.